Machine Games and Bethesda are giving their upcoming alternative-historical shooter a release date and a brand new trailer while announcing a beta for the next entry in the classic first-person shooter series, Doom. Wolfenstein: The New Order will launch on May 20 for the PC, PlayStation 3, PlayStation 4, Xbox 360 and Xbox One, according to the video that you can check out above. But what caught our eye was the trailer’s closing, announcing a Doom beta that will be accessible to those who pre-order The New Order. Bethesda has given out no details following the announcement. We don’t know if “Doom” is a re-make, a re-boot of the series, or the highly anticipated Doom 4. We presume the beta will be for multiplayer. 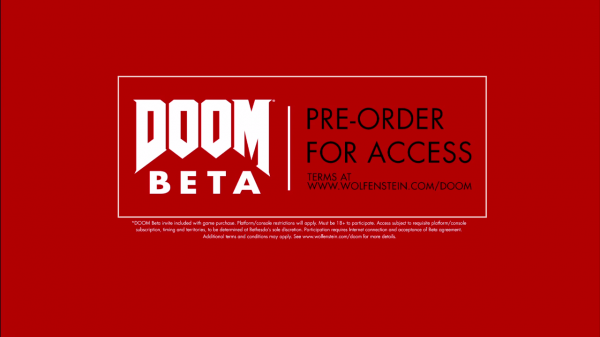 According to the beta’s FAQ, “the DOOM beta won’t begin until a later, yet-to-be announced date,” but you can expect to be contacted by the studio via email once registered at wolfenstein.com/doom. The last we heard of DOOM, Bethesda confirmed the development of a “new version” of Doom 4, one that “promises to meet the very high expectations everyone has for this game and this franchise.” However, development was “indefinitely” postponed back in 2011.